The girls led the pack in the Open Race taking 1st, 2nd, 3rd, 5th and 8th place to give them 19 points for the win! Sarah Crall came in first place with a time of 21:52 followed by Sydni Nedza (21:56), Julia Nelson (22:06), Kyra Mazanec (22:24), and Emma Janas (22:53). Rounding out the top seven were Willow Brown in 10th (23:00) and Megan Schneider in 15th (23:27). What a strong showing for all who competed! Hannah Garcia led the DVCC girls in the Freshman Race with a time of 23:21, followed by Annika Beck at 25:12, Steeley Beringer at 28:32 and Rylee Reginald at 29:37. Great job girls! Thanks to all who came and cheered on the girls - family, friends and runners who had the week off but came to support their team. It is great to hear the enthusiasm throughout the race!! 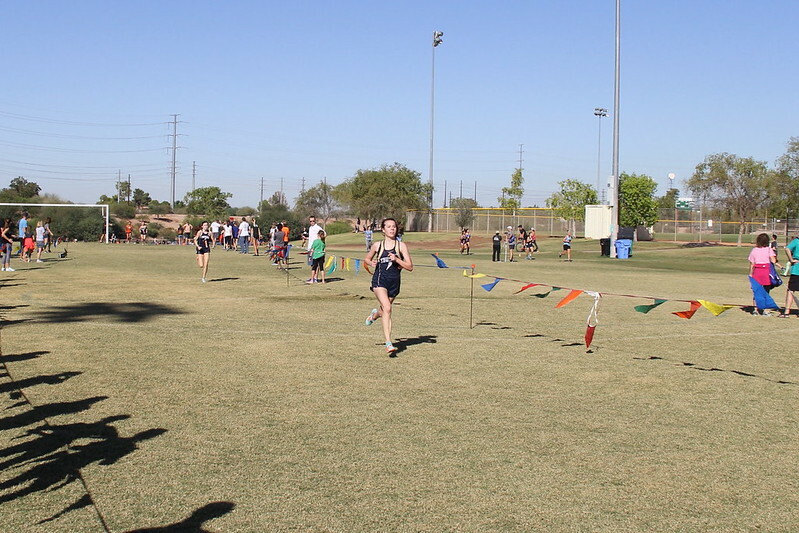 Our next race is the Tempe City Meet on Wednesday, October 18 at Kiwanis Park.